No methods currently exist for the early detection of Alzheimer's disease, which affects one out of nine people over the age of 65. Now, scientists have developed a noninvasive MRI approach that can detect the disease in a living animal. And it can do so at the earliest stages of the disease, well before typical Alzheimer's symptoms appear. Details of the new Alzheimer's disease diagnostic are published in the journal Nature Nanotechnology. 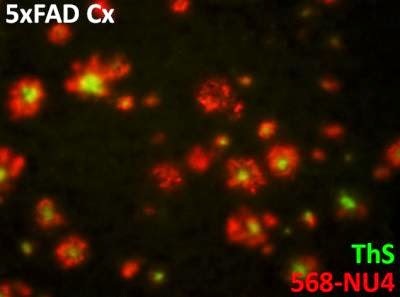 The research team developed an MRI (magnetic resonance imaging) probe that pairs a magnetic nanostructure (MNS) with an antibody that seeks out the amyloid beta brain toxins responsible for onset of the disease. The accumulated toxins, because of the associated magnetic nanostructures, show up as dark areas in MRI scans of the brain. The ability to detect amyloid beta oligomers, is important for two reasons: amyloid beta oligomers are the toxins that damage neurons, and the oligomers are the first sign of trouble in the disease process, appearing before any other pathology. The researchers also observed that the behavior of animals with Alzheimer's improved even after receiving a single dose of the MRI probe. The researchers expect to use this tool to detect Alzheimer's early and to help identify drugs that can effectively eliminate the toxin and improve health.